41 by 57 1/2 in. His subjects are idealized, etherealized even. His women and children live nowhere but in his own vivid imagination . . . and yet one feels that such faces are not an impossibility, and that some day or other, very far in the future, when human nature has become something very different to what it is now, we may meet with such women and children as Merle paints (“Fine Arts: New Pictures by Merle and Bouguereau – Sculpture – The Metropolitan Museum of Art – Academy of Design,” New York Times, May 15, 1870, p. 3). 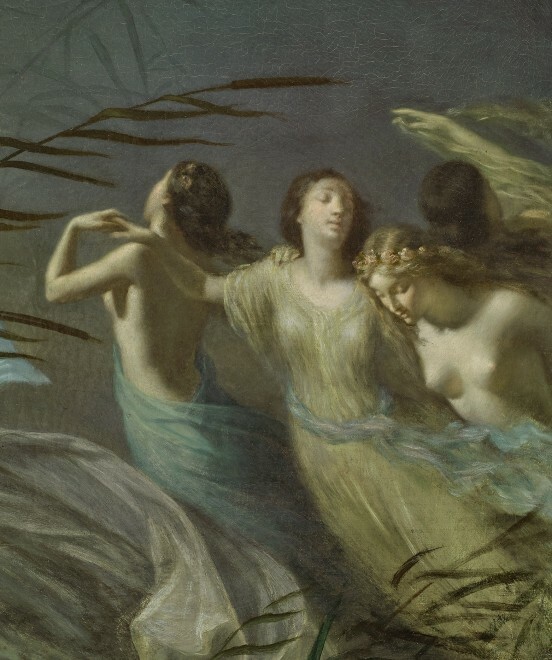 Painted in the year of his Salon debut and exhibited at that prestigious institution one year later, La Légende des Willis may be Merle’s rarest and most evocative work. Its style and subject matter would be supplanted almost immediately by portraits, domestic genre scenes, and biblical and literary subjects, featuring monumental figures firmly grounded in the center of the composition and rendered with the highly polished academicism of Merle’s rigorous École des Beaux-Arts training. These pictures would earn Merle numerous institutional awards and honors, the highest and most vociferous critical praise, and a vast international clientele, who gladly paid exorbitant prices for his canvases even before the paint had dried. 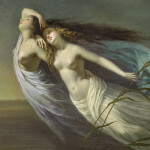 (Indeed, during the 1860s, Merle’s acclaimed colleague and perceived rival William-Adolphe Bouguereau [1825-1905] admitted to emulating Merle to make his own work more popular: “What do you expect,” the artist mused, “ – you have to follow public taste, and the public only buys what it likes. 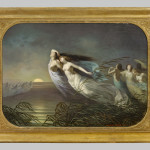 That’s why I changed my way of painting.”) But it is in this very early and ethereal image of a deadly midnight dance that the creativity, intimacy, and latent sensuality of Merle are best seen – fundamental attributes that are too often lost under the highly polished veneer of the artist’s later pictures. There is a tradition of nocturnal dancing known in Slav countries under the name of Wili. The Wilis are affianced maidens who have died before their wedding-day; those poor young creatures cannot rest peacefully in their graves. In their hearts which have ceased to throb, in their dead feet, there still remains that passion for dancing which they could not satisfy during life; and at midnight they rise up and gather in bands on the highway and woe betide the young man who meets them, for he must dance until he drops dead. 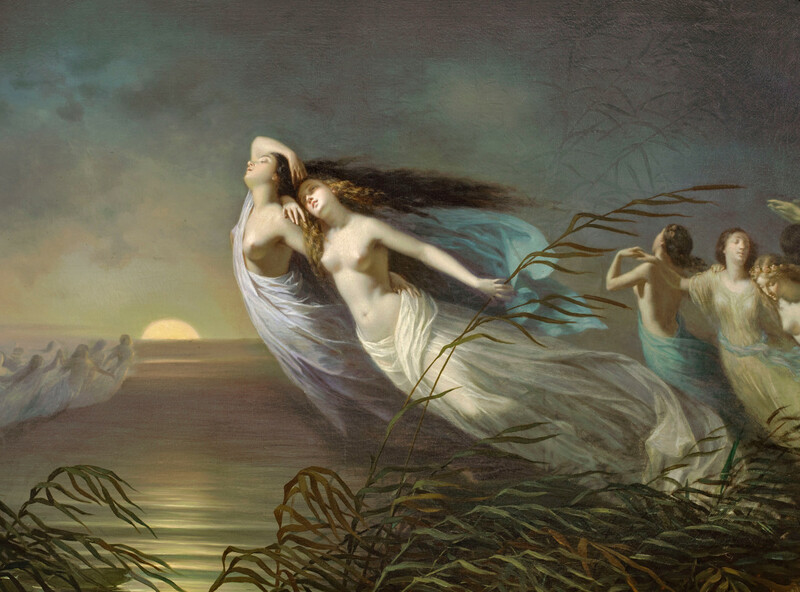 Attired in their bridal dresses, with garlands of flowers on their heads, and shining rings on their fingers, the Wilis dance in the moonlight like the Elves; their faces, although white as snow, are beautiful in their youthfulness. They laugh with deceptive joy, they lure you so seductively, their expressions offer such sweet prospects, that these lifeless Bacchantes are irresistible (Heinrich Heine, quoted in Cyril W. Beaumont, The Complete Book of Ballets, New York, 1938, p. 133). 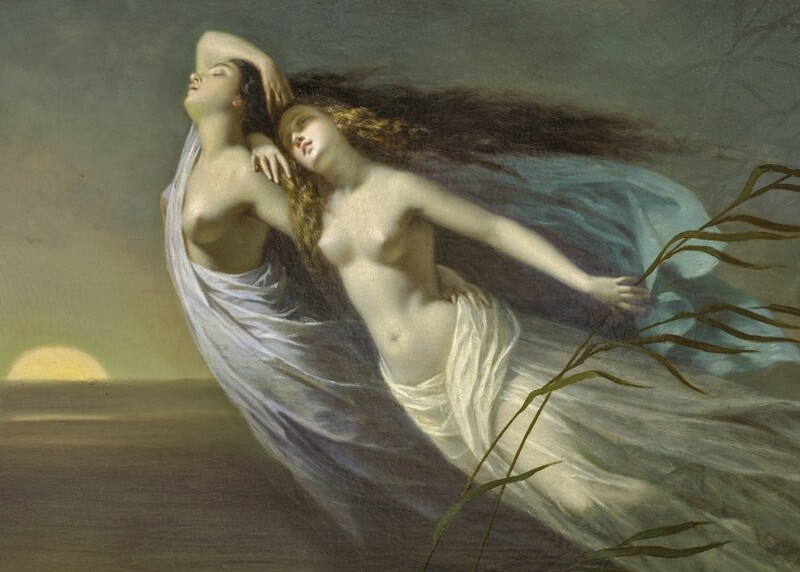 The diaphanous gowns described by Heine are present in Merle’s work, swirling around the women’s lithe bodies as they glide noiselessly from all sides, like will o’ the wisps, to the glade in which they will perform their hypnotic - and lethal - dance. The Salon of 1848, in which La Légende des Willis appeared, was unlike any that had come before. With the abolishment of the admissions jury by the new Minister of the Interior Alexandre-Auguste Ledru-Rollin (1807-1874), nearly 5000 works were admitted, double the number of the previous year. Perhaps due to the sheer number of objects, and also critics’ skepticism as to the quality of these unvetted entries, published art criticism of the 1848 exhibition was far less than in previous and subsequent years. 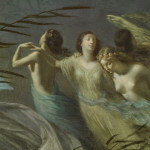 Reviews of Merle’s painting are therefore scarce to none, and its reception must be left to conjecture, but the compelling nature of its theme is easy to imagine – at a time when the French economic system had broken down, and people were suffering from cold, hunger, and deprivation, and in a Salon where artistic liberties could go unchecked, it is little wonder that Merle escaped so emotively to a diverting tale of seduction and fantasy, laced with darkness and caution. The effort would be a singular one in the artist’s prolific oeuvre, making the Willis as rare and as personal a painting as it is a hauntingly beautiful one. 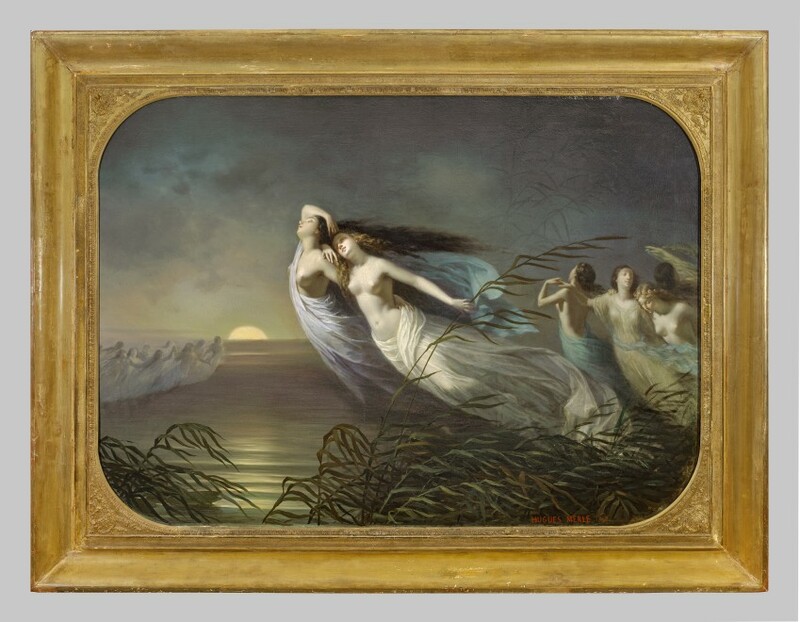 La Légende des Willis was included in the extraordinary collection of nineteenth-century art put together by the leading Parisian collector Monsieur Didier Kahn-Sriber. Kahn-Sriber lived for over thirty years in a mansion near Avenue Foch, decorated in the lavish style of the Second Empire. At the time of this picture’s exhibition, Merle’s address was listed as 9, rue Grange-aux-Belles in Paris’s 10th arrondissement. Merle’s earliest teacher Cogniet (1794-1880) also maintained a studio here. See, for example, “Fine Arts: New Pictures by Merle and Bougeran [sic] – Sculpture – The Metropolitan Museum of Art – Academy of Design,” New York Times, May 15, 1870, p. 3. Quoted in Mark Walker, William Bouguereau: 1825-1905, Montreal, 1984, p. 100. Nineteenth-century ballet was replete with fairies, elves, pixies, sylphs, dryads, wilis, and ondines from the 1830s forward. 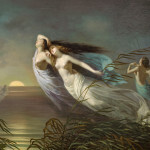 Ballet's airy invasion began in Paris in 1832 with Filippo Taglioni's La Sylphide, and it continued four years later with August Bournonville's Danish ballet on the same theme. Giselle (popularly known as Giselle, ou les Wilis)marked the culmination of this theme in 1841. Though largely imaginary, it is worth noting that the figure of Francesca in Ary Scheffer's painting for the Salon of 1835 (London, Wallace Collection), The Shadows of Francesca and Paolo appearing at Dante and Virgil, seems to have inspired Merle for the figure in the center of the composition, with her delicate, upturned features, bared chest, and closed eyes.